Convenient parking is available at the Hollywood & Highland Center, the premium shopping mall and entertainment complex located in the heart of Hollywood. Valet and self parking are both available at this complex. The parking is located underground and is accessible from both N Orange Drive and Highland Avenue. Guests receive a special validated parking rate when they visit a participating store, restaurant, or movie theater at the complex. Click here for more information including rate and hours of operation for parking at the Hollywood & Highland Center. Hollywood & Highland Center is home to more than 75 retail stores, several restaurants and nightclubs, a movie theater, bowling alley, and the Loews Hollywood Hotel. 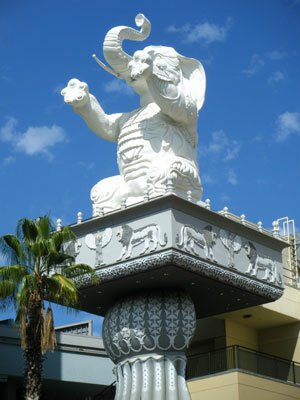 At the center of the complex is a massive courtyard inspired by the movie "Intolerance" that features two pillars with elephant sculptures on the capitals, similar to the film. Many popular Hollywood attractions are located near the Center, including the TCL Chinese Theatre, Dolby Theatre, and Hollywood Walk of Fame.